This recipe is from my mother in law and it’s been around since the ice box days when you had a block of ice delivered and placed in the box. 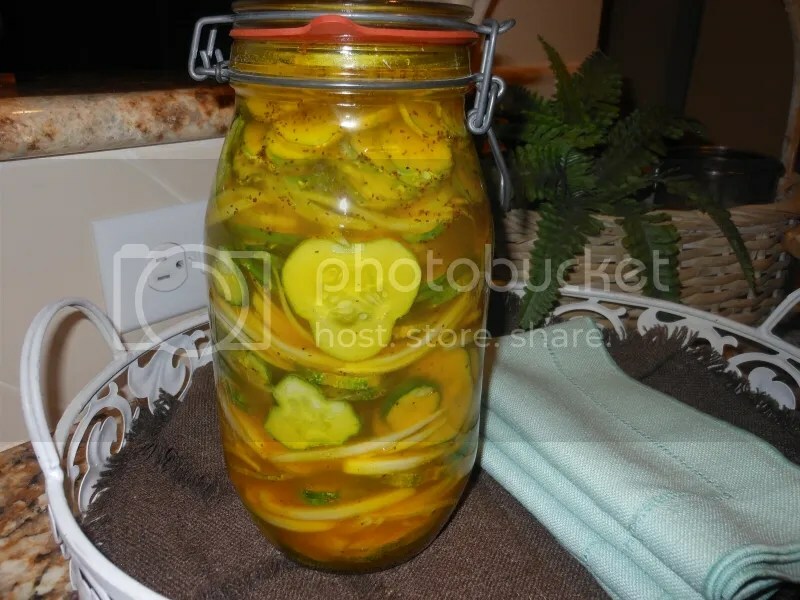 Most of these kind of recipes have a pinch of that and a dash of this so don’t expect the exact number of cucumbers or onions to be included in the recipe. They are tangy and sweet all at the same time and worth the small amount of effort. I make these when I don’t want to go through the whole production of canning. With the amount of cucumbers I pulled from the garden I used a double batch of liquid. Slice Onions and Pickles as thin as possible. Layer in a glass bowl or jar. Mix above ingredients in a sauce pan and bring to a boil. Pour over layered cucumbers and pickles. Let Cool. Cover with lid or plastic wrap. Place in “ice box” for twenty four hours before serving. My grandmother had a similar recipe, but she added a generous dose of Tabasco! I am going to try that on a smaller batch. The day after I blogged about this I went outside to pick more cucumbers and some green worms had completely annihilated everything, including the ones I had left to get bigger. Yikes!! !